JAMESTOWN, N.Y. (October 10, 2014) – The Chautauqua County Humane Society (CCHS) is pleased to announce the totals from their tenth annual Walk 4 Paws fundraiser. Team fundraising, individual fundraising, Tag Days money collection weekends, sponsorship and other various donations contributed to the approximate $34,200.00 total. The money raised will go directly towards the mission of the CCHS. 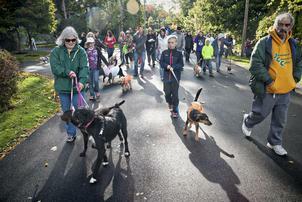 The Walk 4 Paws event was held Saturday, October 4 at Chautauqua Institution’s Market Gate parking area. This year’s event brought together more than 300 people for the exciting day which included a two-mile awareness/fundraising walk and cook out. The top three individuals and teams were announced at the event and will receive awards at a later date. Ellie Hartnagel was the first place individual collecting $1,112 and Flarfy’s Family finished as the top team, raising $1,955.00. The pet costume contest winner was awarded to the pirate and his treasure. “The success of this event is representative of how wonderful our community is that we live in,” said Jeff Lubi, Executive Director for the CCHS. “This event is our largest fundraiser and the continued success is due in large part to the individuals who dedicate their time to raising money for the shelter. These animals are fortunate to have a dedicated community that fights for them,” said Lubi. CCHS would like to extend their sincere appreciation to all those who volunteered and/or donated to the 2014 Walk 4 Paws. The success of the event was made possible by the sponsors and those that volunteered and went out and solicited donations. This year’s lead sponsor was Jamestown Medical Imaging. Additional sponsors included Clark Patterson Lee Design Professionals, Greater Chautauqua Federal Credit Union, UBS Financial Services, Shults Ford Lincoln Hyundai, Team Jock Shop, Fessenden, Laumer and DeAngelo, Alpha Dog Marketing, Southern Tier Financial, Truck-Lite, Invisible Fence of Erie, King’s Heating and Sheet Metal, Lewis & Lewis, PC, S.P. Bussman Design Co., Dog Speak at the Dog Place, Allied Alarm Services, Athenaeum Hotel, Lockwood Agency, The Post-Journal and 106.9 Kiss FM.